My mom has always loved birds of any kind – mocking birds, cardinals, chickadees and especially hummingbirds! So, I surprised her with a late Mother’s Day gift by making her a hummingbird feeder. 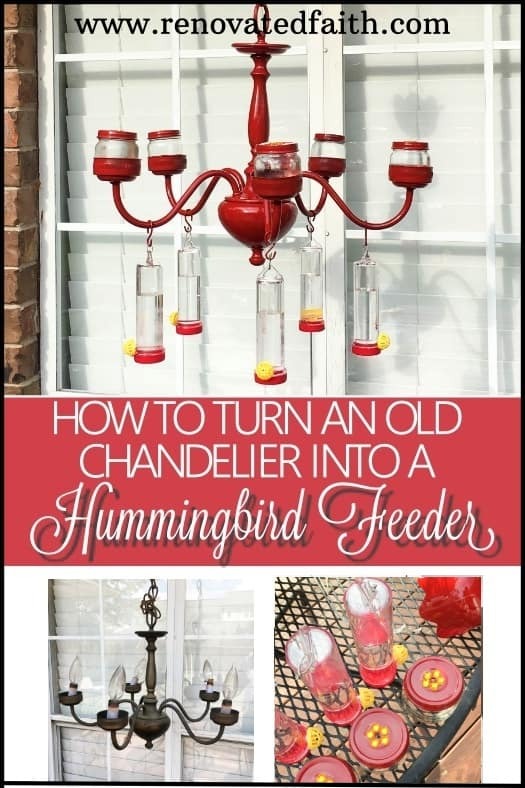 By upcycling an old chandelier, I made a DIY chandelier hummingbird feeder that is sure to make any backyard into a hummingbird haven. 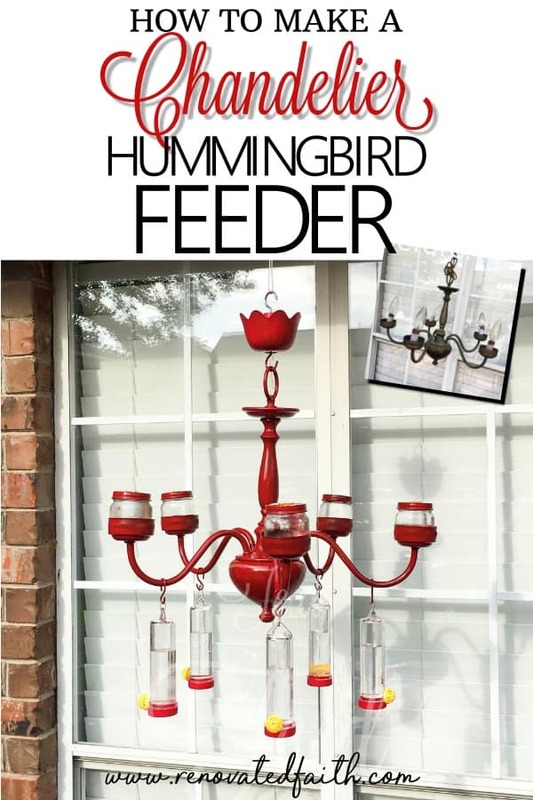 What’s so great about this feeder is the fact that it will attract a huge number of hummingbirds to one location. Hummingbirds like feeders to be grouped together so they are easy to find. Also, there should be plenty of ports for them to feed from to prevent them from fighting and so they can get all the “nectar” they need. When I was a kid, our neighbor had two dozen hummingbird feeders lined up in rows under her back porch. Towards the end of every summer, we would go to her house and see all the hummingbirds. I kid you not, there were at least 200 hummingbirds swarming around the feeders at any given time. The best part was standing in the middle of the feeders and staying very still as they flew a few inches from us! My hope is that this feeder will give you a taste of that in your own backyard! The first step was to find an old chandelier and I can’t think of a better place than Habitat for Humanity’s Restore. If you haven’t been to your local Restore, they have lots of used items that are in need of a new home – everything from old doors, to picture frames and even slightly used cans of paint. An added bonus is that all the proceeds of their sales goes to building homes for people in need! You can find your local Restore by going HERE. It is there that I picked out this beauty. Here she is in all her dust and cobweb-filled glory! 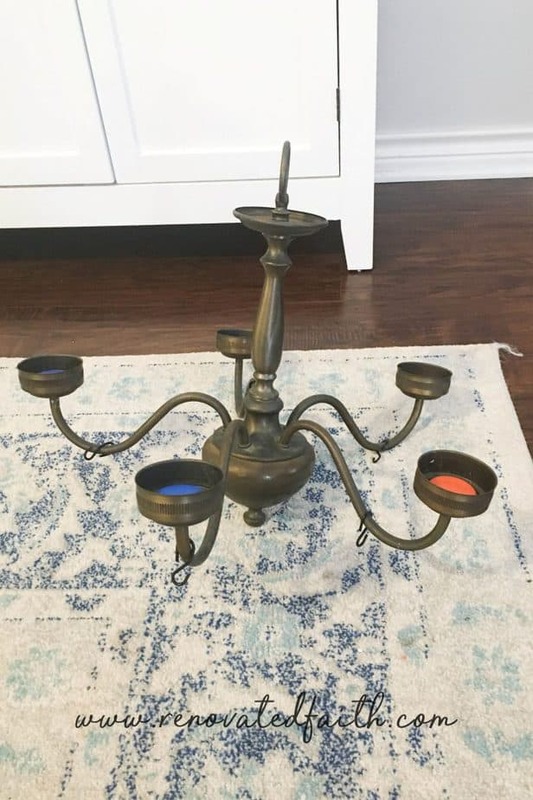 This chandelier has definitely seen it’s day and now it has an opportunity to be reused for a whole new function! I love every chance I get to upcycle old items that would have otherwise been thrown out, giving them new life and purpose. Of course I decided that I needed a hummingbird feeder for myself, so I picked out this chandelier also. I had some slightly different plans to integrate a hanging basket with this feeder! 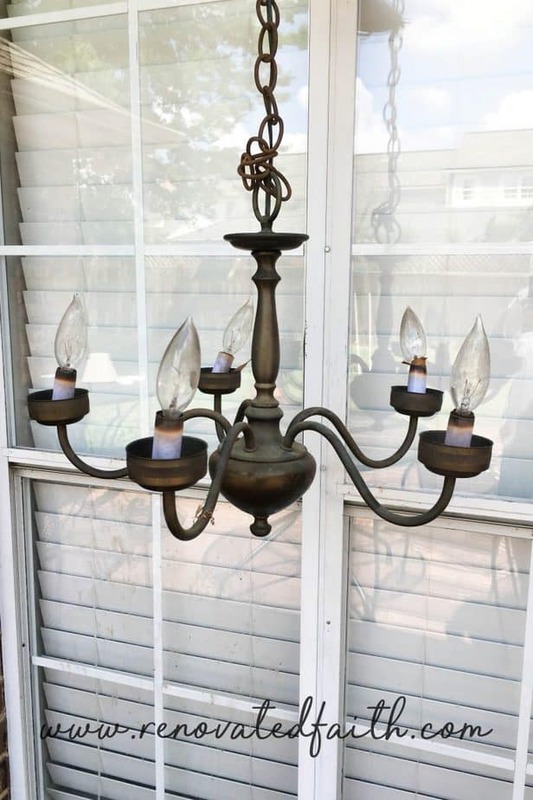 Old chandelier – check out your local Restore! Each was $10. 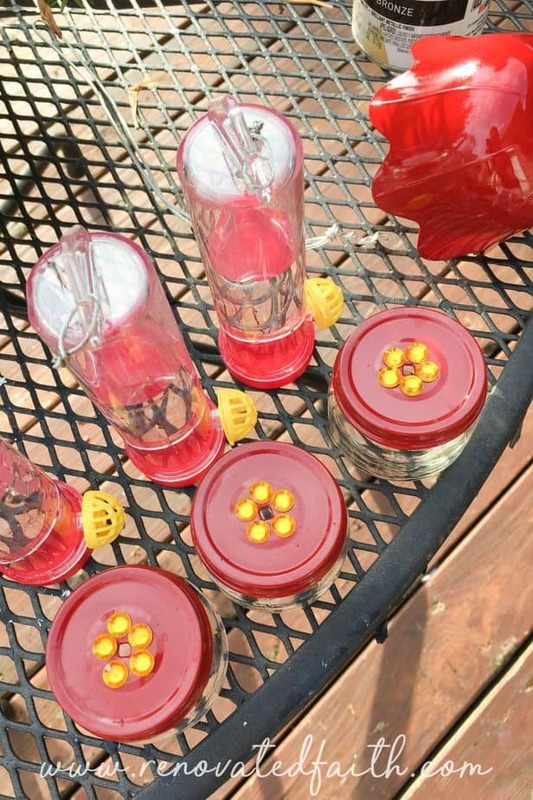 Hummingbird feeders – I used these for my mom’s feeder and these for my hanging basket feeder! 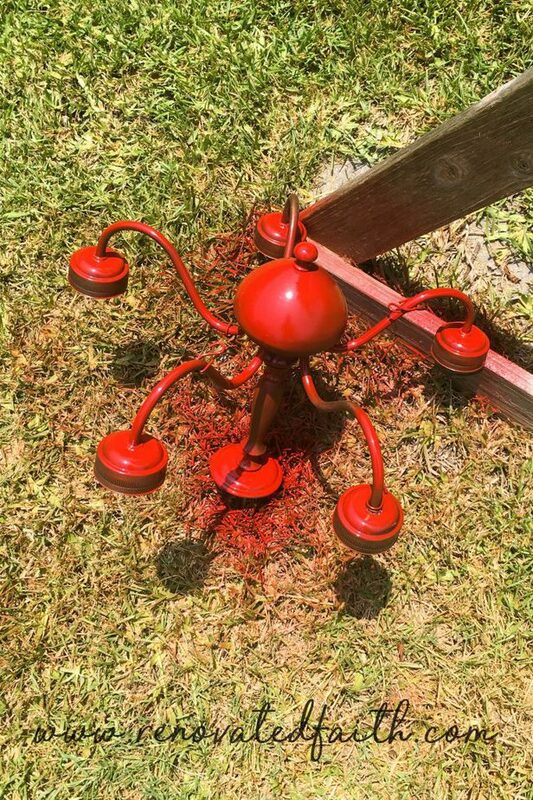 Spray paint – Use whatever color you prefer but I used this red spray paint for mom’s and this oil-rubbed bronze for mine. Ant moat – This ant moat is great for keeping ants out of your feeder! Hummingbirds won’t come near it if ants are trying to drink their sugar water. Baby food jars or small spice containers – I used baby food jars but they also have these online. 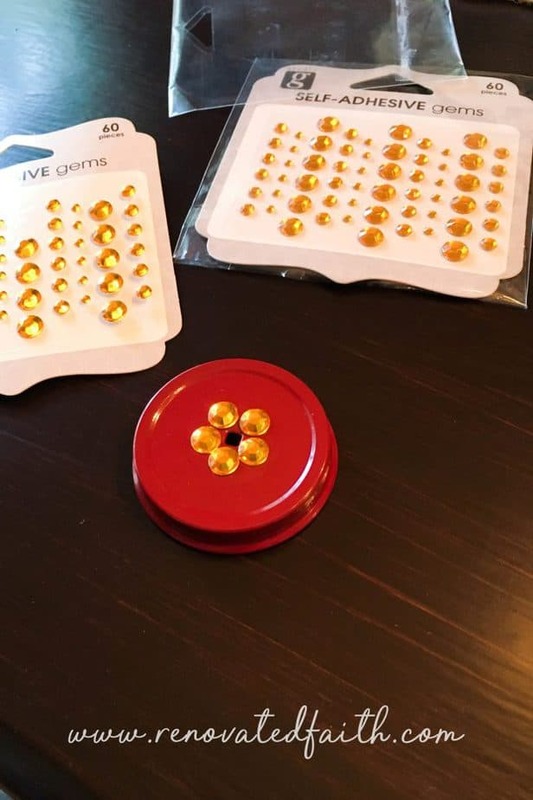 Yellow Rhinestone Jewels – I used something like this. Velcro – Velcro even comes in an Extreme Outdoor version now. 1. First, take off any wires, bulbs or other hardware that you will not be needing. I used some wire cutters to help this process go a little faster. 2. Next, you want to wipe off any dust from your chandelier. 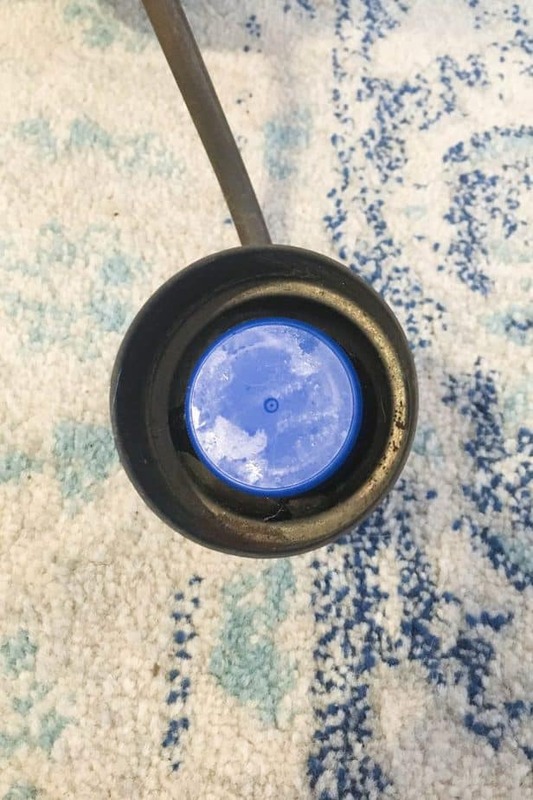 It doesn’t need to be perfect but you don’t want your spray paint adhering to a layer of dust as opposed to the metal (and mine definitely had a thick layer of dust!). 2. Because I didn’t know what to do with the parts of the chandelier that held the bulbs, I decided to add tiny feeders using baby food jars. After I took out the lighting hardware there was a small area that stood up in the middle of this section and I needed a flat surface for the baby food jars. So, I glued in some lids of various sizes to make it flat with my E6000 glue. 3. Spray paint is one of the few things that really does require following the instructions on the can. Most spray paint will say that you can re-coat either within an hour OR after 48 hours. Don’t make the same mistake I have and try to re-coat 24 hours later. The paint will inevitably start to peel away from the piece. I sprayed the bottom of my feeder first and then hung it from my daughter’s swing-set to finish spraying it. You could also use a tree limb. Shake the can before spraying and also slightly shake it as you are spraying. Spray one light coat over the piece. You are not trying to get full coverage yet; you just want to get a thin first coat on and it will look very spotty. Then, wait ten minutes and do another thin coat. Every 10 minutes do a very light coat until your piece looks covered in paint. This method will save you from having drips and having to re-coat after 48 hours. 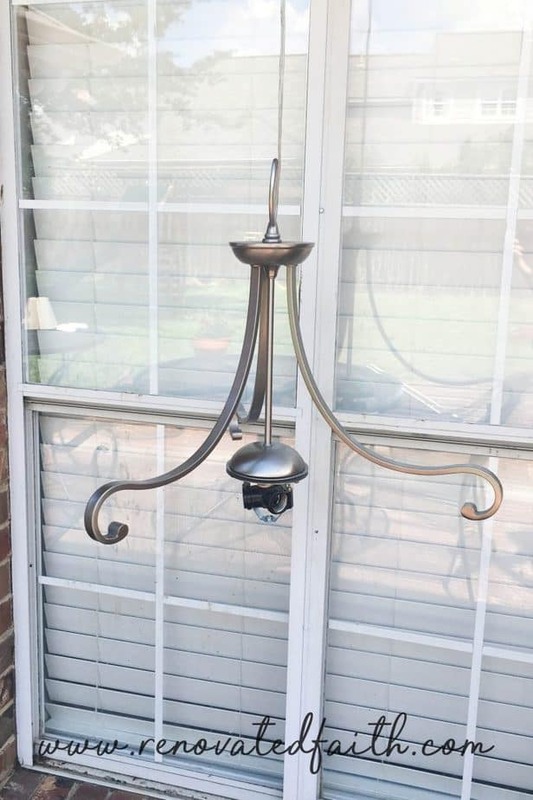 You also might want to spray any hardware or S-hooks used to attach the feeders to the chandelier. Let the chandelier and hooks dry for 48 hours. 5. Now, attach the jewels with hot glue to make a flower around the hole. Hummingbirds like shiny things so they will find these small feeders with their yellow jewels to be irresistible. I used pieces of velcro to hold the tiny baby jar feeders in place so the wind doesn’t blow them off. 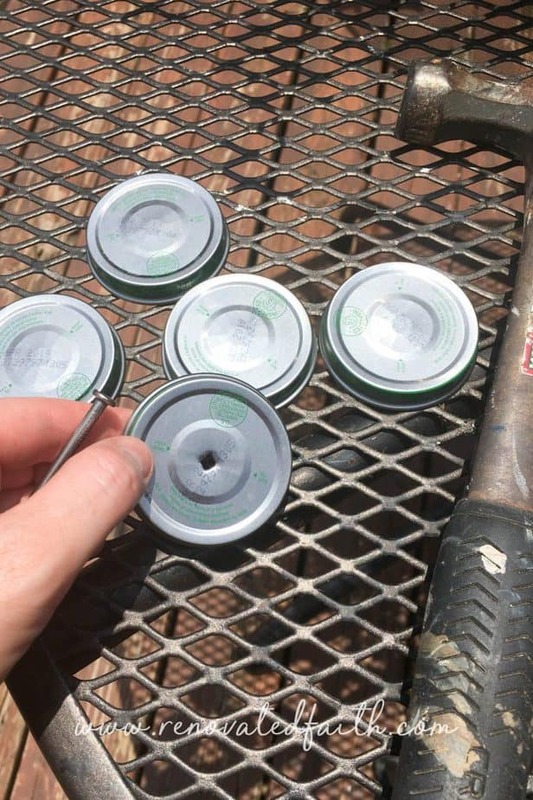 The velcro also allows for easy removal when it is time to refill the feeders. 6. 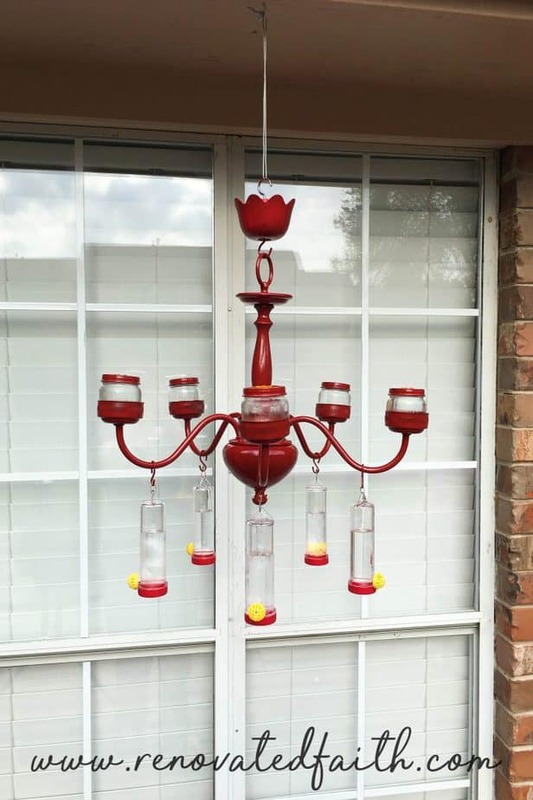 After your chandelier has dried 48 hours, you can fill your feeders with sugar water and hang them on the chandelier. Hang your feeder in a location that doesn’t get full sun all day so that the nectar doesn’t spoil as quickly. Add one part sugar to four parts water and boil to remove any bacteria. Fill your feeders and store the rest in the refrigerator. Be sure to skip the red food coloring because it is actually dangerous for hummingbirds. Didn’t it turn out cute?!? The shine of the spray paint gives it an unexpected touch of class. 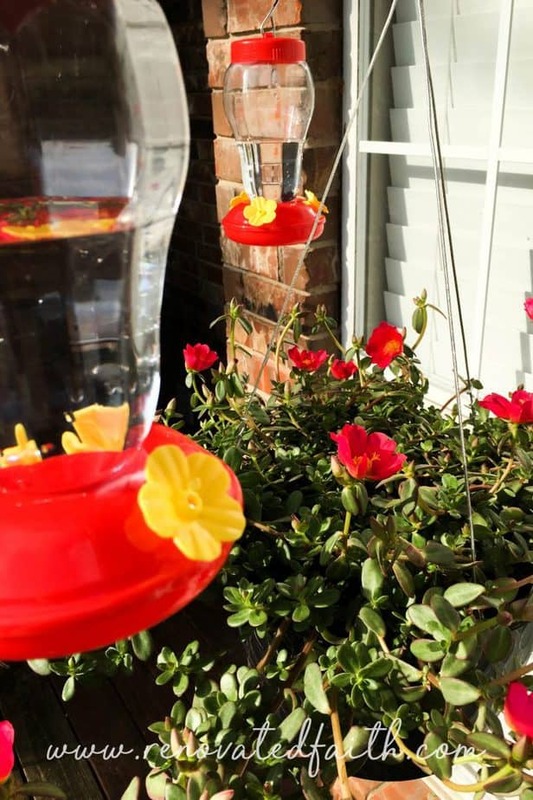 Now you can gather the supplies for your own feeder to fill your backyard with hummingbirds. To attract even more hummingbirds and butterflies, you can add flowering plants into your landscape design as I discussed in my post 10 Steps To Affordable Curb Appeal. 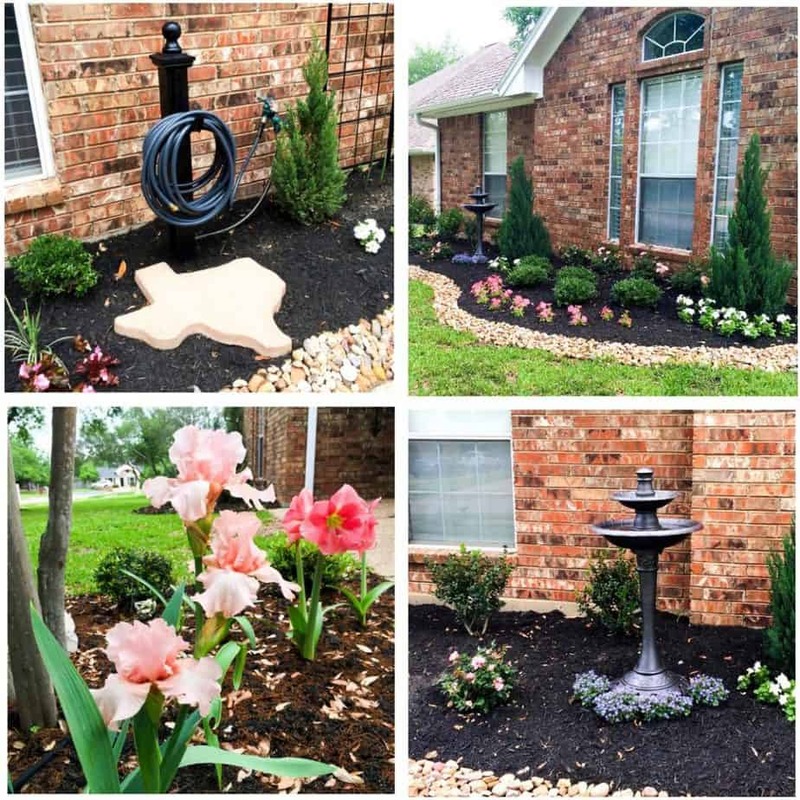 CLICK HERE for more Outdoor Decor from Renovated Faith! 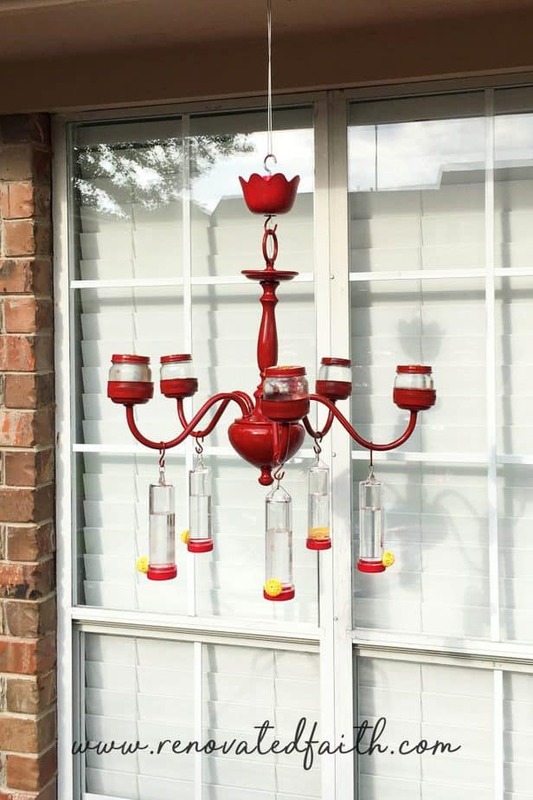 Mom was pleasantly surprised with her red chandelier hummingbird feeder and I love how mine turned out as well. 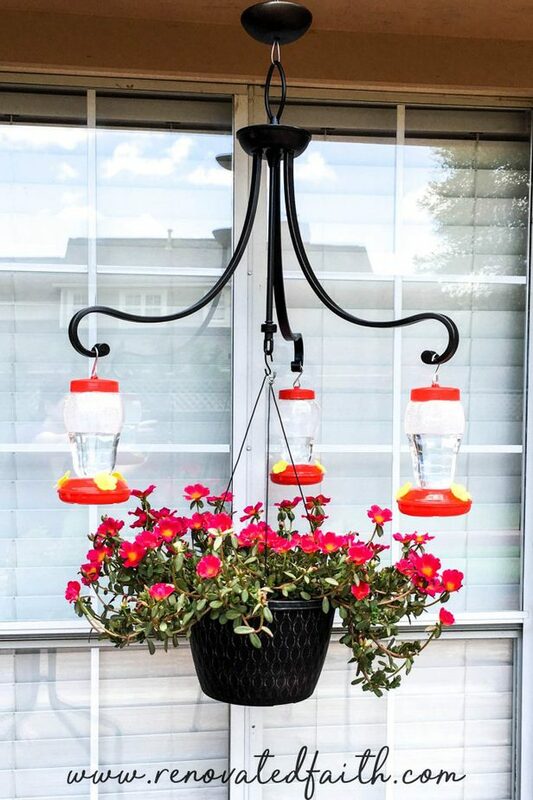 I added a hanging basket to mine to also attract hummingbirds. Will you obey God even when His commands don’t make sense? Sometimes God tells us to do things that are seemingly out of left field. It’s as if every fiber of our being is telling us this new course correction flies in the face of our long-held plans and agendas. However, if we take our eyes off our own course and pivot in the direction of the unexpected, He might just surprise us. We are sure to be blessed by the incredible plans He has always had in store. The chandelier’s story doesn’t end in a trash heap, but instead it is given new life, and a new purpose. Thankfully we have the same story in Christ. God is leading you in a direction that seems strange or at least unexpected, know that one day it WILL make all the sense in the world. You will be thankful you stepped out in faith even when it didn’t make sense at the time. What a wonderful idea! I love working in my garden. It reminds me every day of all the beauty and love God has for us. I truly enjoy reading your blog. Thank you for reaching out to others sharing the live of Christ! Thank you so much Martha! I so appreciate your encouraging words. Can’t thank you enough! I love this idea, and it does sound like the perfect Mother’s Day gift. I, too, am a huge fan of my local Restore. I’ve lost count of how many things I’ve bought there to style my home! 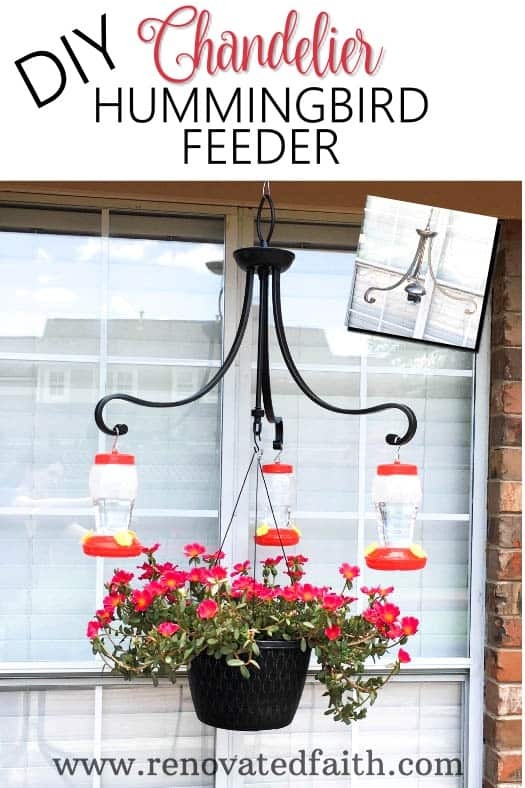 This feeder is nice because it’s functional, but it’s also a statement piece. Have you gotten any comments from neighbors about it? It looks like it has curb appeal. Anyway, excuse my fangirling, but it’s a great post, and your blog is very uplifting, too. Thank you so much for your sweet words! Yes, it is a great mom gift. My mom loved it…granted, she would love a toaster that I had spray painted and hung from her back porch. Thanks for stopping by Lela! It really is! I had fun picking it out and getting it exactly how I wanted it. I think a turquoise one would be pretty too. I hear hummingbirds like other colors instead of just red. Thank you for stopping by Tessa!